Today I have a skin care product to share with you that I think is totally worth all the money. La Rochey- Posay is a french skin care brand that is available to us Australians at Priceline and Terry White Chemists. This particular product I recieved in a Lust have it! pack. My skin is really weird. I have an oily face and a dry body. My hands in particular get dry and patchy very fast. 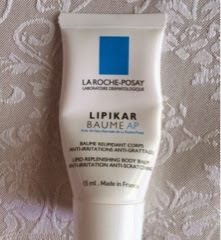 I have tried numerous hand creams till I found the lipikar baume- my holy grail. My problem area lies between all my fingers. It could be heriditary as my mom suffers from psoriasis. 24 hour anti scratching efficiacy. Quick dress texture for fast absorption into the skin. Adapted for babies and children. Fragrance free, paraben free lipid replenishing care, specially formulated for very dry, irritated skin prone to itching. Fortunately I don't suffer from itching, its only dry white patches for me. I have used a number of hand creams and lotions, even resorted to oils but nothing has helped calm my skin like the Lipikar. It is non greasy and fast absorbping into the skin. I usually use it morning and night after my face routine. Most hand creams effects wear off after you wash your hands but with this product I found that even if I wash my hands every hour it did not dry my skin up completely. I have been using it for about three weeks now and have noticed a difference in my skin. You only need a pea sized amount for both your hands and it hydrates the skin all day long. I have completely used up the sample and can't wait to buy the full size. Also since the ingredients are suitable for babies all you sensitive skin girls and boys can use it without any fear. The full size retails for $37.95 and you get 400 ml of product which will last you a long time. I plan to buy mine from Priceline but you can find it at Terry White Chemists too. If you suffer from dry patchy skin like I do then I totally recommend you to try this product out. It has honestly worked wonders for me and I highly recommend it.